As the golden age of travel waned, one of the most notable casualties was the cruise ship. The mid-20th-century saw a sad decline with the arrival of soggy buffet food and polyester clad lounge singers. Fortunately, a revival has not only returned dignity to the high seas, it has also introduced an entirely new breed of cruise ship. Big boats are out (Cunard’s QM2 excluded), and sumptuous mega-yachts are in. In this modern waterworld, lifestyle is everything, and The Yachts of Seabourn—one of the tops in this category—showcases the four key elements essential in the new world of cruising. 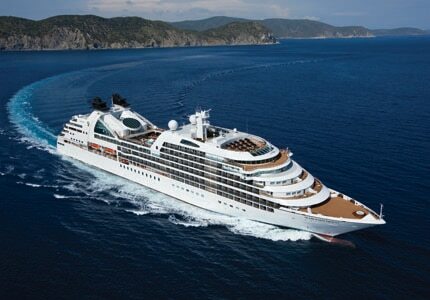 Each of Seabourn’s three all-suite ships hosts 208 passengers at a time. This means more than just personalized service. These yachts can go where the behemoths can’t, into small harbors and up rivers to major cities. Cruises have always been inclusive, but today it’s what’s included that sets the small luxury yachts apart. On Seabourn: Charlie Palmer cuisine, wine, Champagne, massages on deck and preferred tee times on golf courses around the world. Cruising is no longer about where you go, but about how you get there. That’s why Seabourn offers—along with itineraries to destinations around the globe—customized shore excursions and a Dress Circle lecture series that includes celebrity chefs. Naturally, each cruise line wants to stand out. Among Seabourn’s many distinctions is Caviar in the Surf, a silver service beach barbecue in which uniformed stewards wade into the surf to serve caviar and Champagne.